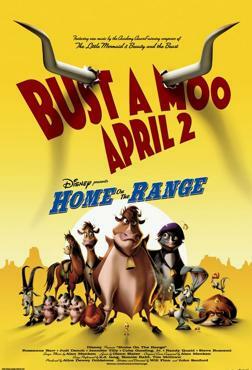 This week the DFPP team was trying to pick up a bounty on some cattle rustlers when they were moosmerized by an udder disturbance of technicowlor proportions in the 2004 animated movie Home on the Range. Seriously, better than "BHC"? I kinda like this film. Worst podcast episode ever. Don't you have any films you really like? I'm starting to lose intrest in this podcast if you keep reviewing films you hate. Y'know, that part about 15 minutes in where you complained about the actress' voice is kinda mean. People can't help how their voices sound, after all. By the way, where's Bree's review? Hi Nick: First I'm Sorry that Ryan and Todd didn't like the film. Unfortunately we can't all like everything. I'm not sure if Brie is submitting a review for this. Hi Nick, sorry, but we can't like every film, and we don't try to spread it out. We do them in the order we pick for good or bad. We've rated a number of films in the 4s and some 5s have been given out for sure. I think that this week was a by week for Brie's blog post. She normally arranges that with Ryan.